A sharpened stick is repeatedly tapped to tattoo a young backpacker's arm. 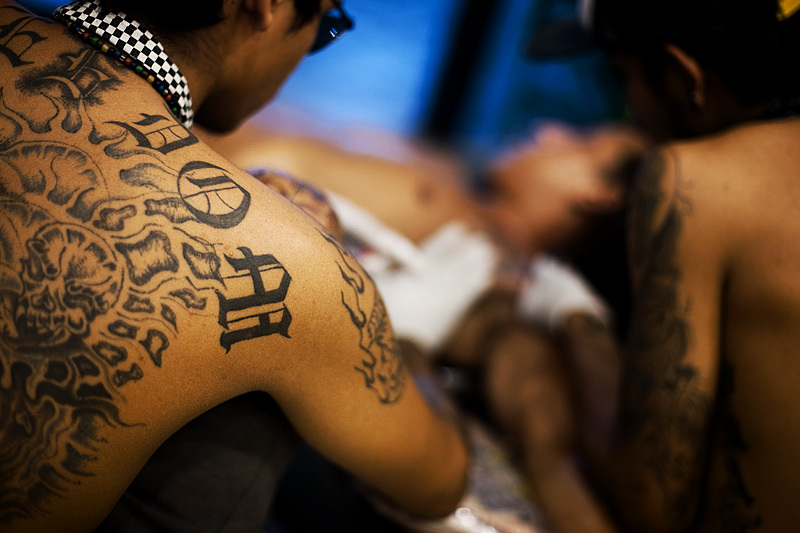 There are a disproportionate number of tattoo parlors lining the walking street of this small island. The ability of these tattoo shops - 6 by my count - to remain in business speaks volumes of foreigners' desire to receive tattoos on their 2-week beach holiday. Tattoo parlors on tiny Ko Lipe easily outnumber doctors' offices, banks, pharmacies, and probably give the number of travel agents a run for their money. A supine Swede receives a slowly tapped-out bamboo tattoo. This is the old Polynesian art of bamboo tattooing. A sharpened stick is dipped in ink and slowly tapped to deliver its colorful contents beneath the epidermis. The process for this arm tattoo required three days of 4-5 hours sessions of what appeared to be excruciating pain. Two tattoo technicians color a drawing onto a young traveler's arm. It seems, by necessity, a tattoo artist should use his own product for the purposes of "street cred." In case you're curious, the entire tattoo reads "FREEDOM" in a font favored by California street-gangs.